I am so excited to be back with OMTWI for Round Three! 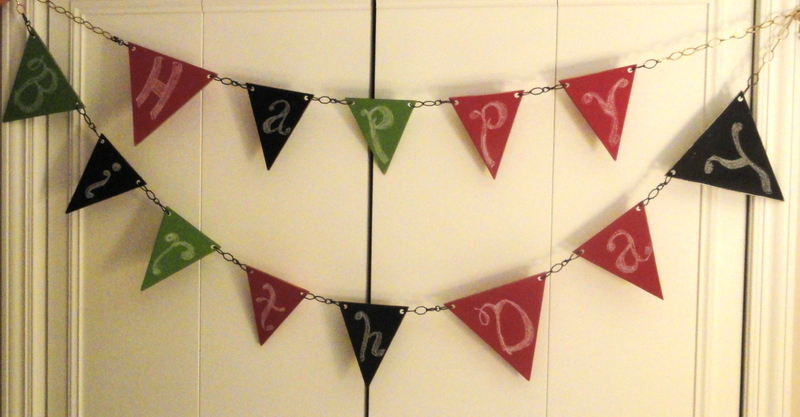 The challenge this week was to create a bunting or banner; to me, a bunting is usually associated with some type of celebration. With Valentine’s Day quickly approaching, I thought it fitting to make a bunting to celebrate none other than LOVE (I’m a sap like that). And where better to display a love bunting than near to your heart, right? I love that this project can be adapted for many types of buntings… maybe a number signifying a birthday age, a year for a graduate, or perhaps a date for a wedding? Thanks again for keeping me here for Week Three – I’d be head over heels if you’d vote me into the the Final Round! Good luck to all of these fabulous ladies! To say that I am thrilled (if not shocked) to still be in the contest is an understatement. Looking at all of the entries so far I am blown away by everyone's talent & to be included with them is really amazing. Thank you so, so much for everyone who voted for my past projects!! 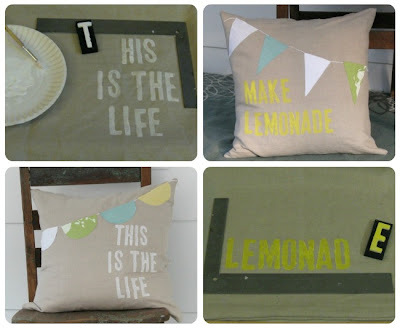 Onto this week's project...the challenge was to make a project that included a bunting or banner in some way. I had a ton of ideas, but I decided to go with this. Sorry that I forgot to take some pictures while I was making it, I just had so much fun that I forgot..(bad blogger, that I am). 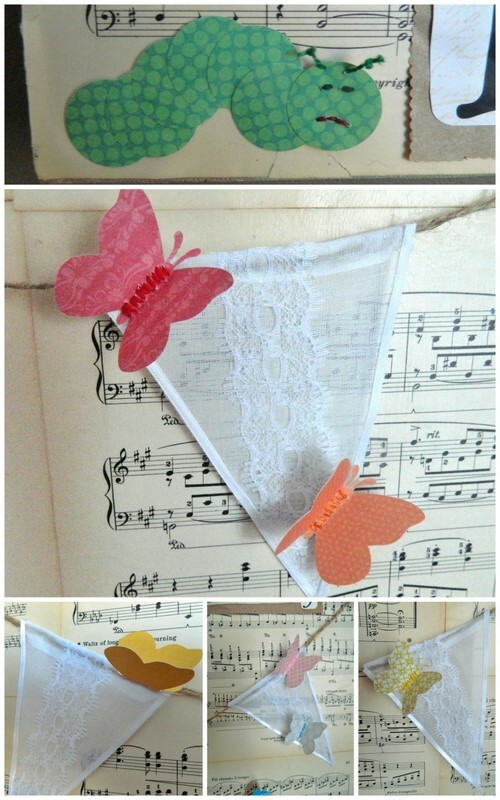 I decided to make a bunting out of some sheer white fabric, some lace & ribbon that I had. I wanted it to have a light, airy feeling. 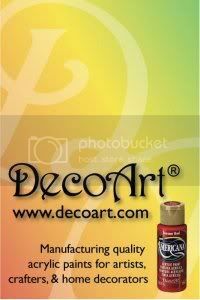 For the background I decided to cover a canvas in some vintage sheet music & Mod Podge. Next I made some butterflies out of some colorful scrapbook paper. After making them I decided to stitch their bodies with coordinating thread for a little more detail. I also made a little caterpillar using the same method. 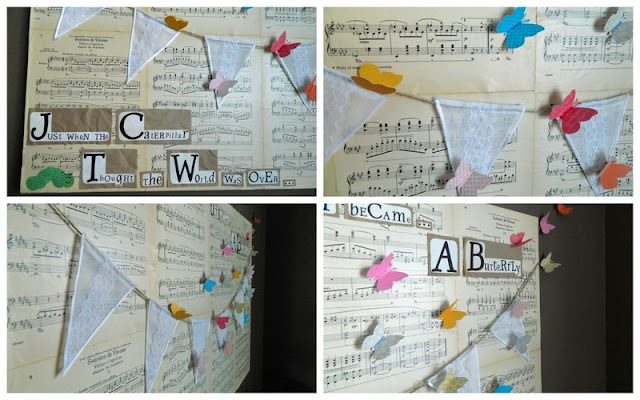 I then attached everything to the canvas, making a few of the butterflies "fly" off. I wanted it to look as if they were pausing or resting on the bunting before taking off. To tie this all together I put saying on it that I always have loved...."Just When The Caterpillar Thought The World Was Over, He Became A Butterfly". I'm hoping that every time someone reads this they will remember to be positive because life is just bursting with possibilities! Whee! I made it through another week against very stiff competition. I was pretty excited when I learned this week's theme of banner or bunting. I had planned to do this very project as a Father's Day gift and it didn't materialize - One Month To Win It gave me the perfect kick in the pants to get it finished! My parents live in a coastal community that has recently permitted the use of golf carts on the roads. It's a quirky kind of place where people name their houses, and now; their golf carts. This nautical banner spells out "The Crab Cart". 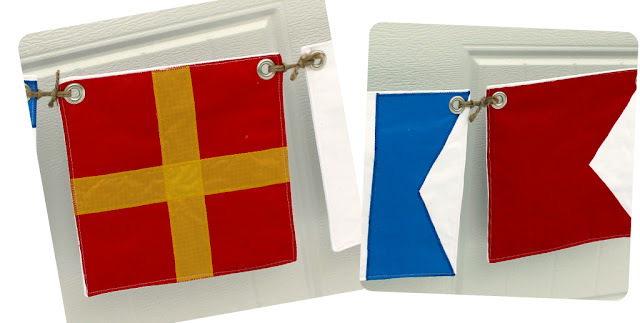 The 9" square flags were created from ripstop nylon appliqued onto heavy cotton canvas. I then added a 3/8" grommet in each corner, and used jute twine to string them together. Let me tell you - if you ever need a good forearm workout, try squeezing 22 grommets into place! I'm happy with how it turned out and it was fun to sew - I hope my parents enjoy it just as much! I am so glad I made it through to Week 3! Let me tell you, I have been most excited about this week since we got the list of themes. When I saw "Bunting and Banner Week", this idea immediately popped into my head! The Macy Goes to the Fair Dress! I am beyond excited with how this turned out! If you're anything like me, you know that ideas in your head don't always translate well into real-life items, so when it does, it's like hitting the jackpot! 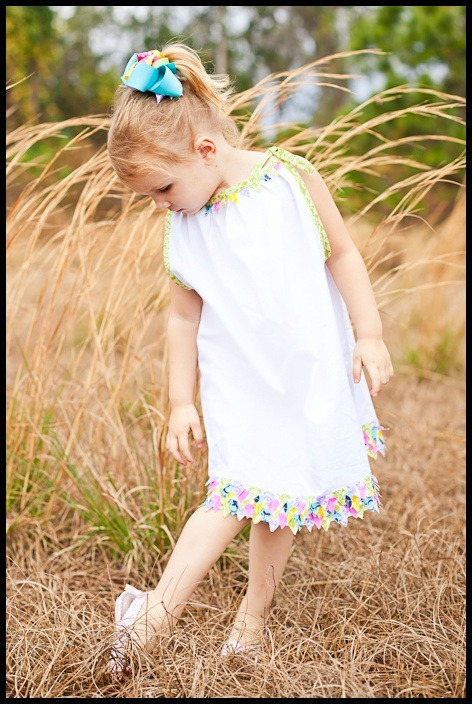 I started out with a pillowcase dress and altered the pattern to work for my idea. I added box pleats to the neckline which make me think of a Big Top at the fair. Then I made a mini pennant banner and trimmed the neckline with it. I finished off the neckline and arms with bias tape I handmade. But of course I couldn't stop there! I cut out approximately 1 MILLION little bitty triangles (really, about 250) and stitched on 5 rows of the tiny pennant banner to the hem of the dress. I love it so much! 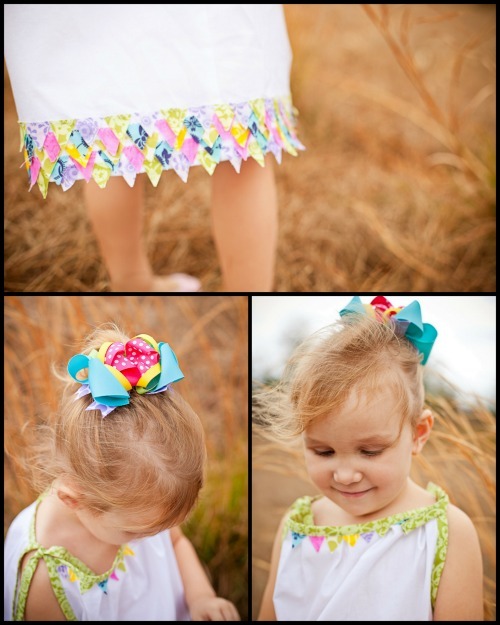 This dress is a great stash-buster project! All the little triangles were made from my scrap bag. The bias tape was made from fabric left over from another project. I love using things I have on hand! Let me just start off by saying this competition has been so much fun so far. I have definitely been inspired by all the beautiful projects my competitors have done. 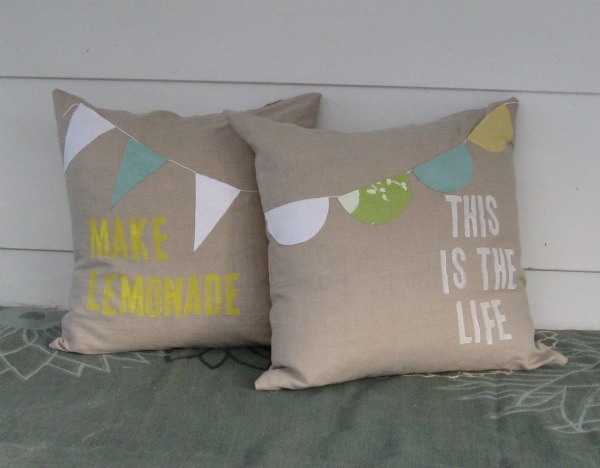 Okay, so first of all, pennants, banners, buntings - do they all mean the same thing? I never seem to know which word to use. 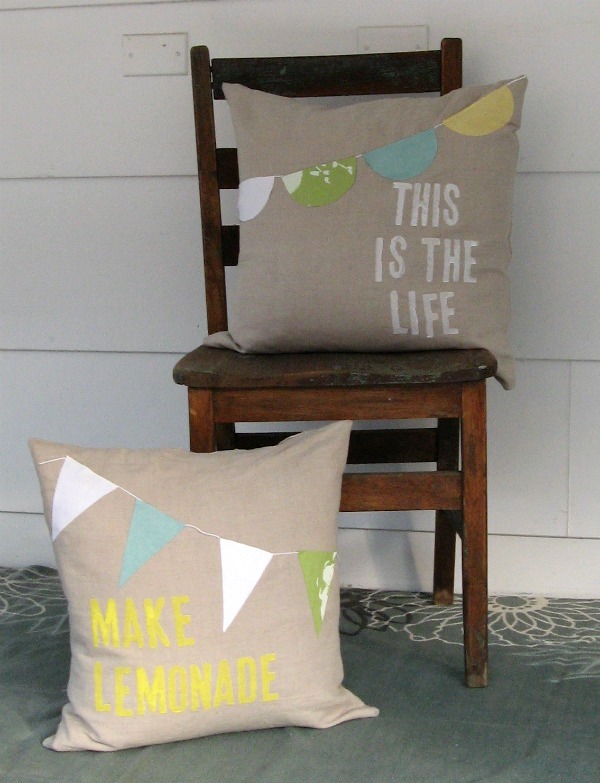 But when I think about banners and bunting, I think about happiness and summer. This sure isn't summer so I decided a really cheerful project was in order. Because everyone can use an extra dose of sunshine in the dead of winter. I decided some happy pillows were in order. My first task after sewing the basic pillow cover was to choose some nice, peppy sayings for my pillows. 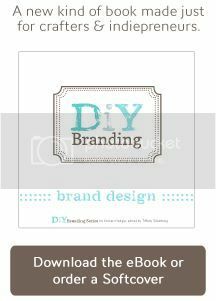 (I'm a sucker for typography in design.) I was lucky enough to pick up a great set of alphabet stamps at a yard sale last summer. 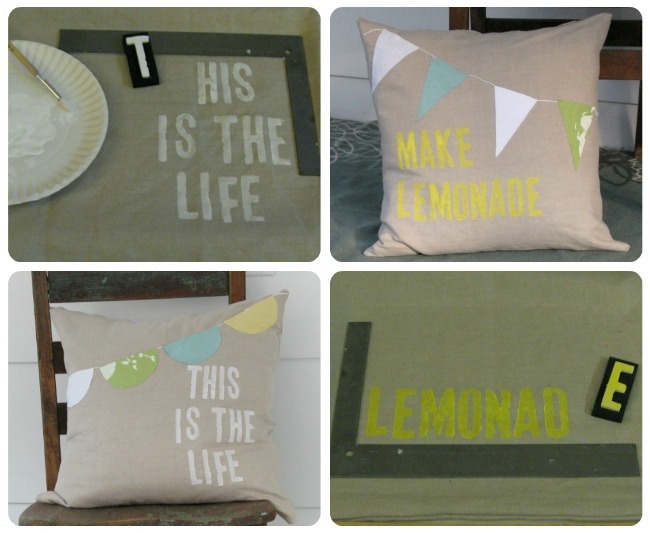 I mixed some craft paint with fabric medium and then painted it on the stamps and stamped the pillow covers. I gathered some colorful fabric scraps and cut out my bunting pieces. I simply used stitch witchery to attach them to the pillow covers and then filled them with some down pillow inserts I had on hand. 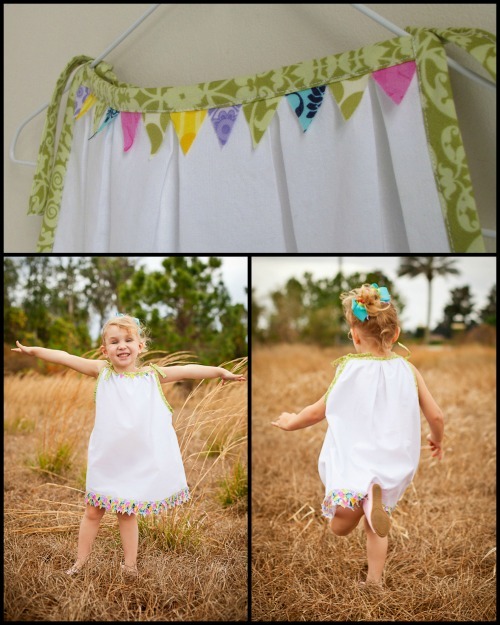 I love the contrast between the playful bunting and the linen background. Happy pillows for sure. How exciting to still be here--HUge THanKs for voting my projects through! -A BUNTING- I had to write Lisa to ask what it was. "Do you mean, like a, BABY bunting?" I know "buntings"-thought it was a banner-are HOT in Mixed Media circles --but just really not my interest. I had to seriously ponder this project. And I'm excited to share my version! Wow! This challenge really showed me just HOW pragmatic I am. 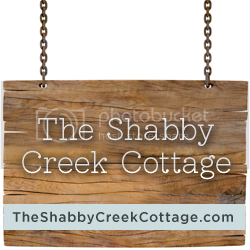 Linked by chain and clasps to expand or shrink! So Today's message---? Happy Birthday! And Tomorrow's message---? Finish Line! I don't know how anyone will be able to decide a favorite! Everything looks amazing! I'm sweating this week!